Dressing appropriately for an event can be challenging. You never want to be underdressed and overdressing can be embarrassing. The most stressful outfit to pick out is for a "Semi-formal" event. A dress code that is somewhere between formal and casual, most people have no idea what to wear. But no worries, whether you're attending a corporate event, anniversary party or a wedding, we've got you covered! First, check the invitation for the time of day of the event. The time of day as well as the event location will tell you a lot in terms of attire for the event. 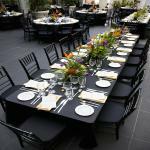 Typically daytime events are more casual while evening events are more formal. If the event is during the day (before six o'clock), it is appropriate for men to wear dinner jackets with tailored slacks or trousers (or even a suit). Both light and dark suits are acceptable, but save the khaki and white linen for summer events. Women may wear a summer dress (if the season is appropriate) or a cocktail dress. Hem lengths may vary, but keep it classy - anything more than one inch above the knee is inappropriate. If you'd rather not wear a dress, business suits and pantsuits are also acceptable, as long as it is not made from wool, which is too casual. Heels or flats are suitable. An event after six o'clock requires evening attire, which is a little fancier than daytime attire. Men should wear suits in more formal hues, such as navy or black, with a four-in-hand tie and polished shoes. Vests may be worn as well. For women, an evening semi-formal event calls for either a cocktail dress or pantsuit. Silk, taffeta, chiffon and velvet are all acceptable. And of course, finish your outfit with a cute pair of heels or flats and accessorize with your choice of jewelry. No matter what you decide, remember that it is always better to be slightly overdressed than underdressed. Sneakers, t-shirts, and shorts are never acceptable for a semi-formal event. And of course, if you're going to a wedding, wearing white is never appropriate! If you're still not sure how to dress for a semi-formal event, don't hesitate to ask your friends who are also attending the event, just to make sure you are all on the same page. What did you wear to your last semi-formal event? Did someone else show up under or over dressed? Let us know on Facebook, Twitter or by leaving a comment below!